235 records – page 1 of 12. 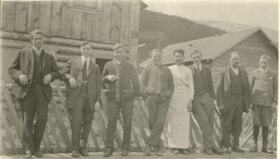 Written on back of postcard: "L to Right 1914 (early) Smithers- 1) Eddie Hole railroad fireman- 2) Arthur Elliot [?] 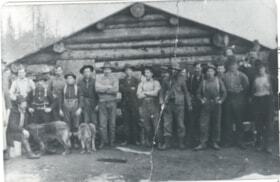 stenographer Grand Trunk Pacific 3) Bill Underhill - blacksmith (wind house) 4) Bob Checkley (self) clerk- 5) Yuen - chinese cook - 7) Harry Darling & son roundhouse foreman 6) Bud Fisher - accountant"
History from Bulkley Valley Stories, pp. 133-134. 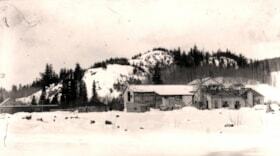 Historical information from Bulkley Valley Stories, pp. 133-134. 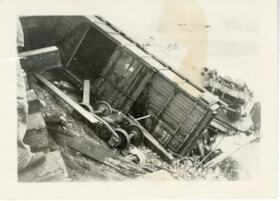 Written on back: "Train Wreck. Carpenter, Mayer and 1 other killed. O. Hanson escaped." Construction of the Grand Trunk Pacific Railway commenced in 1905, under the direction of Charles Melville Hay. 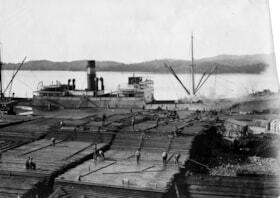 The present site of Prince Rupert was selected as the Pacific terminal and the community to be known as Smithers was made a station on the line. 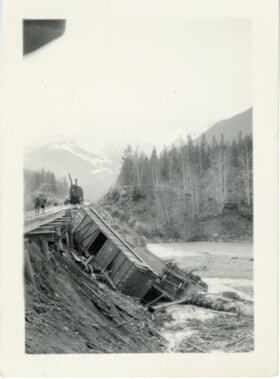 The Grand Trunk Pacific Railway was taken over by the federal government in 1919 and eventually became a part of the Canadian National Railways system. 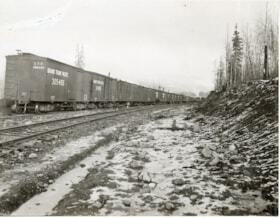 Fonds consists of a administrative records, including time books, distribution of labour procedure, table of spirals used on Mountain Division and an engineer trip ticket booklet related to the GTP Railway station in Smithers, B.C. 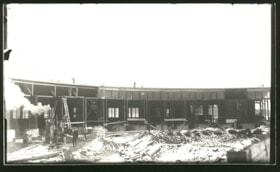 Records also include a tourist booklet, blueprints of the interior of the Smithers Station, as well as the exterior, and plans for a GTP water tank. Records were rearranged intellectually in September 2016 by Manda Haligowski to better reflect archival standards and to improve accessibility. Series #3 added by SK and WC October 2003. Series #4 added by SK, JY and WC November 1, 2003. November 2016: Prince Rupert Terminus of the GTP book cover (1988.19) has been transferred to the Prince Rupert Archives. 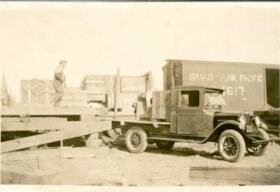 Written on back: "Irma GTP loading train"
Grand Trunk Pacific pile driver. 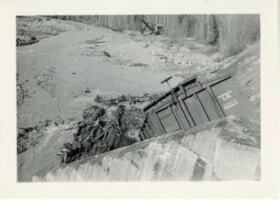 Title based on photograph contents and description on backside of photograph. 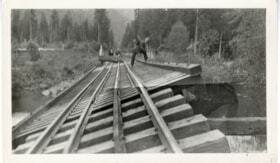 1 photograph: b & w; 14 x 8cm. 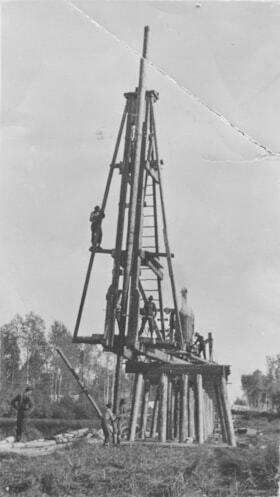 Written on back "The pile in the [?] at the signal she is dropped splash with the machine again and so- until the pile top will come under the hammer of the driver. then they drive as we have see them back home. 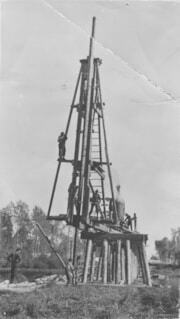 The crew is 8 men, an engineer (c.c.) and an extra. In action they have a language all their own". and dated "7/3/1979." Photograph is mounted on a gray cardboard frame. 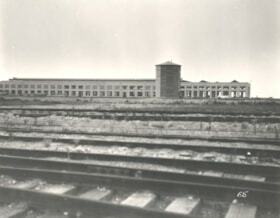 1 photograph: b & w; 11.5 x 9cm. 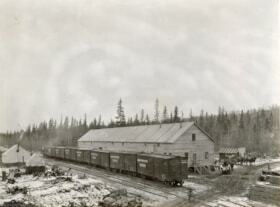 Grand Trunk Pacific, Hazelton B.C. 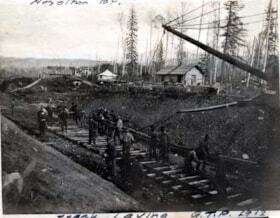 Grand Trunk Pacific laying track at Hazelton. 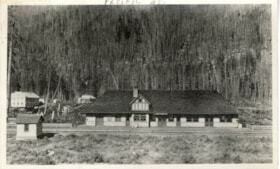 GTP Station at Pacific, B.C. Nichol Hotel can be seen in the background. 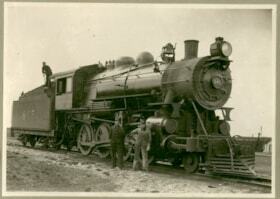 Written on back is: "To Alice. A Happy and Prosporous New Year to you my Friend. Sandy"